Hello, I am an 18 yo male, about 180cm and weigh 65kg. There is an event every year here and everybody runs about 2.2km. I go running 4-5 days a week and I usually run 2.2km at a fast pace (8:50) or 3.7km at a slow pace (17:45) depending on the mood... my aim is to beat the first guy in cross country (2.2km) whose time was 8 minutes. So I am basically around 1 minute behind. The event is next year so I have time but I am willing to push the training sessions quite intensely. How can I improve my speed and running endurance for 2.2km and cover the distance in less than 8 minutes? Should I run slow for a much longer distance (7km)? Or run 2.2km as fast as I can everyday? The main key to becoming faster is, at first, to run slower and further. At first. 2.2km is predominantly an aerobic race. You need stamina, a strong aerobic base. I would encourage you to first build up your running training to a point where you can quite comfortably run 10k. Not fast, just conversational pace. Also check out my Base Running-page. Once you can do that comfortably, test yourself on that 2.2km. I would hope that you'd already be faster at that point in time, although your legs might feel slow because of the slower running you have done. So even if you are not faster at that point in time, don't worry, we'll just get to the next stage. After that, start working on adding in some Tempo Running. This will improve your lactate threshold. So you would now be doing long runs, easy runs and once or twice a week tempo runs. Then, much closer to the race, work on Interval Running as well. This will improve your body's ability to deliver oxygen to the muscles and will help you get used (to some extent) to running with lactic acid in your legs. This way, you should see quite some improvement in your running times. I am not sure if you will break the 8 min goal you set yourself. That will depend on your abilities / your talent and your commitment to the task. But this at least uses the right building blocks at the right time. I can also wholeheartedly recommend Daniels' Running Formula. 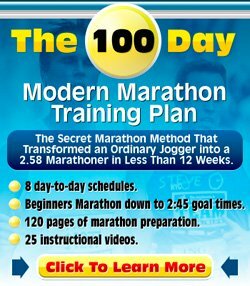 This book contains a lot of information about why you need the different running speeds, but also contains running training templates that allow you to put together your own running training plan. Best of luck with your running and keep us posted on whether you win the race or not! No worries, man, happy to help. I am not saying the 8 minutes is impossible for you. I just don't know how well you will improve. The good thing is that it is probably 10% talent and 90% hard work, so as long as you put in the hard work, I have good hopes that you will be fine.